What fashion-savvy woman doesn’t enjoy a great manicure for a dazzling night out on the town? Maybe you’re searching for a design for an upcoming date – or perhaps you just want to feel fabulous with the girls. 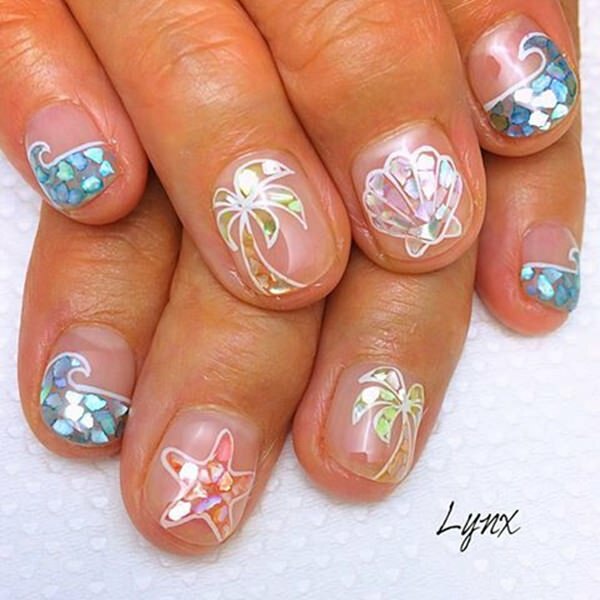 83 pics of stunning and dazzling nail designs, bound to give you the inspiration you need for the occasion you’re going to look gorgeous at! This design looks amazing in winter or autumn, resembling the empty branches of trees that decorate the barren landscapes surrounding us during these two seasons. Duel pinks in the background give the effect of a warm sunrise or sunset. This is a lovely combination of hearts, kisses, and glitter. A theme like this is perfect for Valentine’s day – and isn’t tacky with overly done sparkles or hearts. 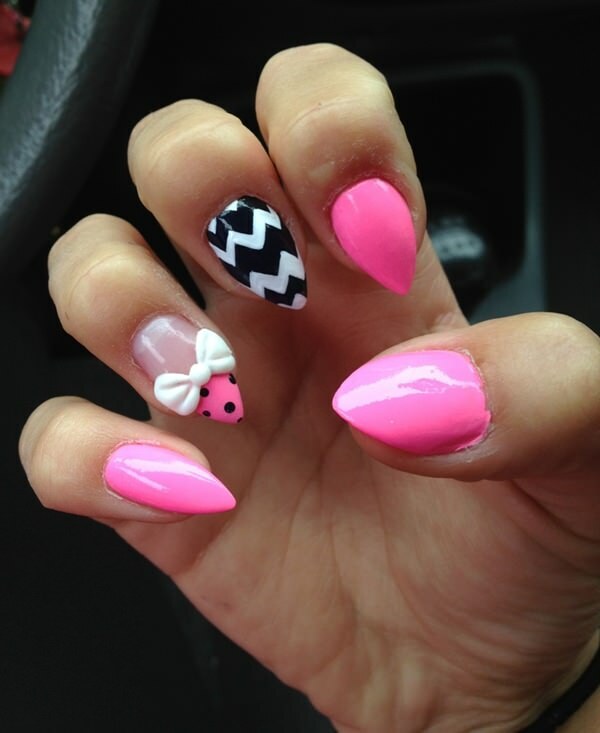 You could also wear nails like this on a date if you’re trying to clue them in on giving you a first kiss! Penguins! 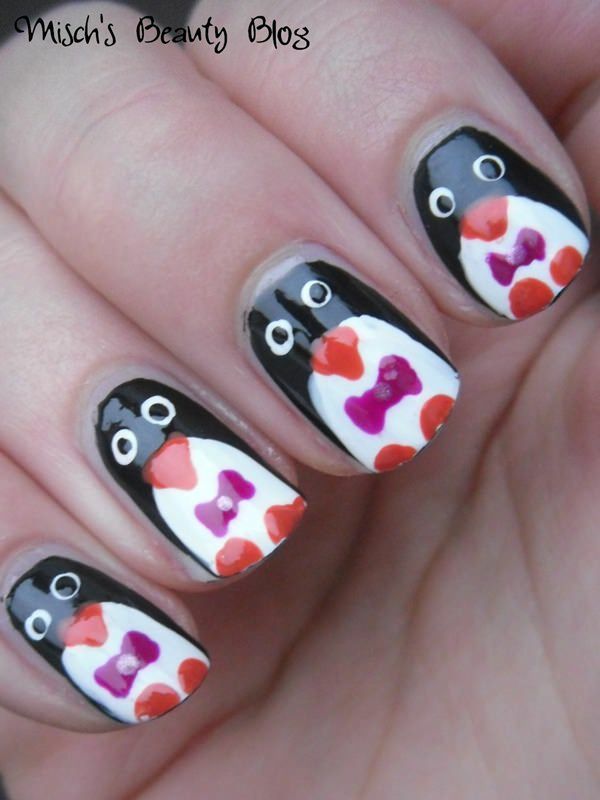 They’re adorable and easy to create on your nails if you’ve got a steady hand. Use toothpicks for the finer details if you don’t have special décor polish brushes. You can switch up the bow ties with any color that matches your outfit or style. 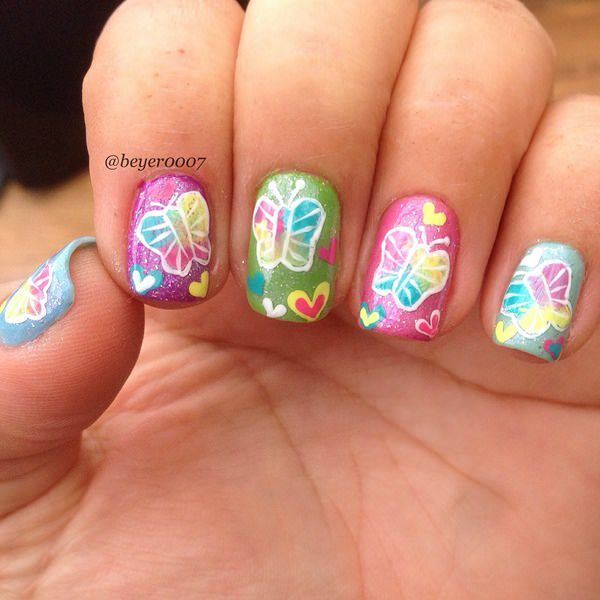 This design is commonly found in the beauty section of any supermarket and comes as either fake glue-on nails or as sticks your can cut accordingly to your nail size. I wouldn’t recommend creating a design like this by hand, unless you’ve got a lot of time on your hands and are a fabulous artist with a steady hand! Girly and dominating, this design is perfect for girls that are a glorious twist of both. Stiletto tips have an edgy look and feel, while the pink and singular bow give you softer appearance, just enough “girly” to satisfy your inner Goddess. 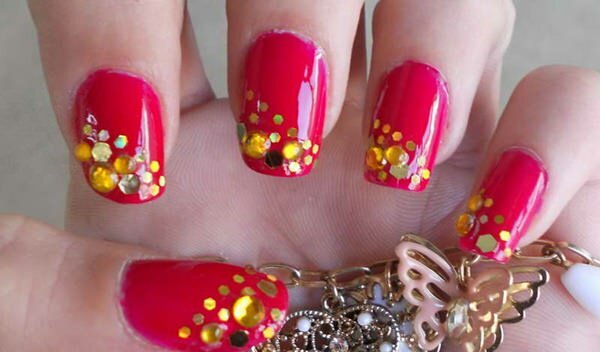 Paint your nails a dark shade of pink or purple, and glue on small yellow gems on the tips at an angle to give yourself a chic sun spotted garden on your fingers. The contrast will attract attention and can match many differing summer and spring outfits. 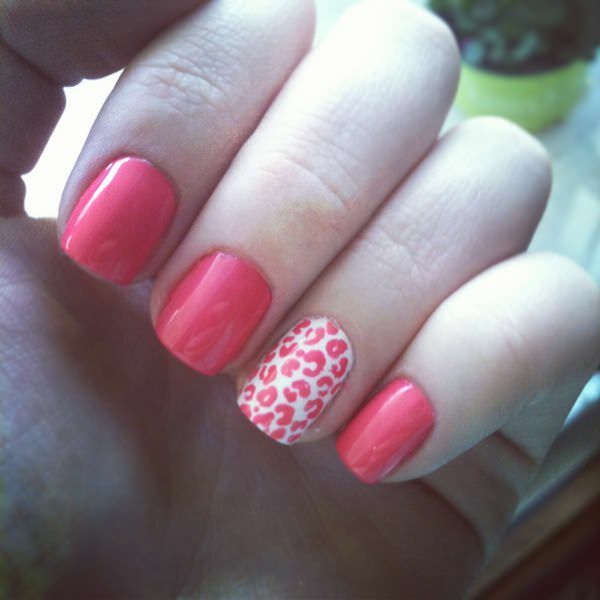 Placing animal prints on any part of your apparel, including your nails, automatically gives you a wild and powerful look and feel. 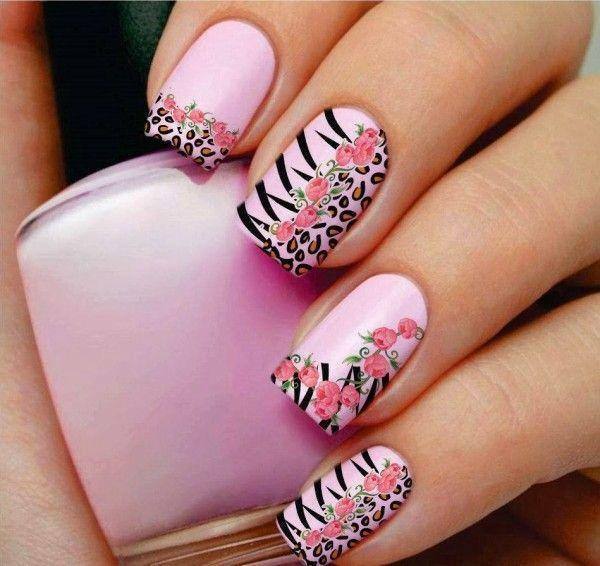 Mix up zebra and leopard patterns with some pink roses and you’re ready to show off your prowess! 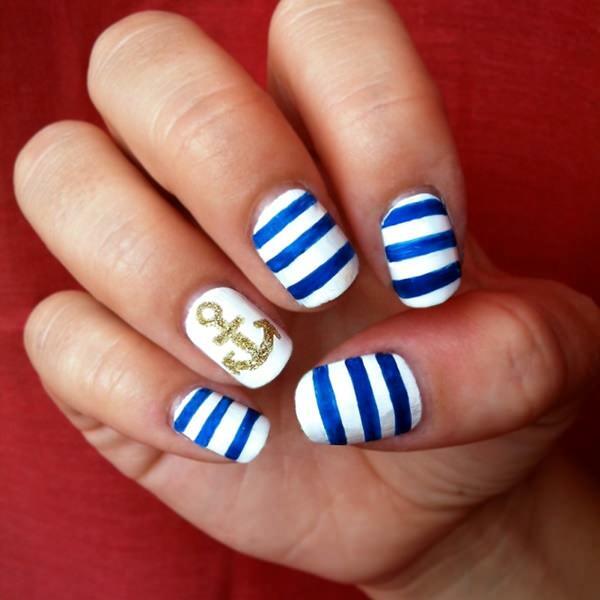 The anchor can easily be done with a toothpick or thin nail polish brush, with any color of your choosing. Gold gives it a more realistic effect, and the stripes are a wonderful addition to complete the cute sailor look you’re after. 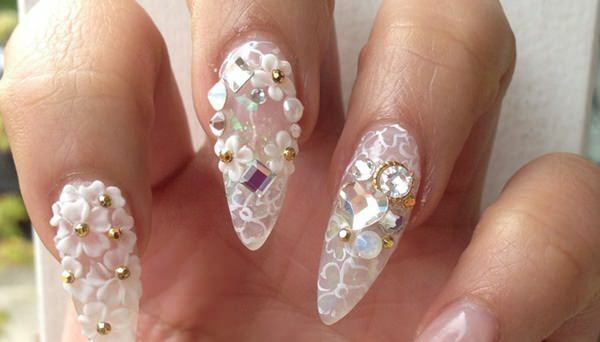 Nails like this would work well in a business setting. 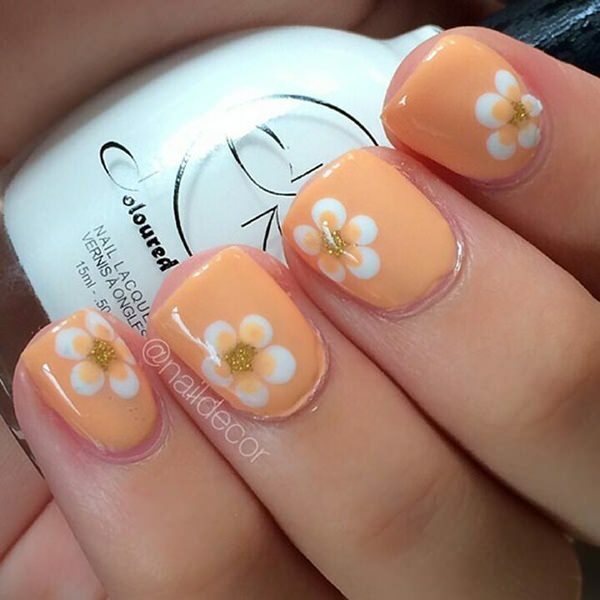 If flowers with big yellow stigmas (the center of the flower) remind you or invoke a sense of bliss or summer, why not go for such flowers on your nails to consistently remind you of happiness? 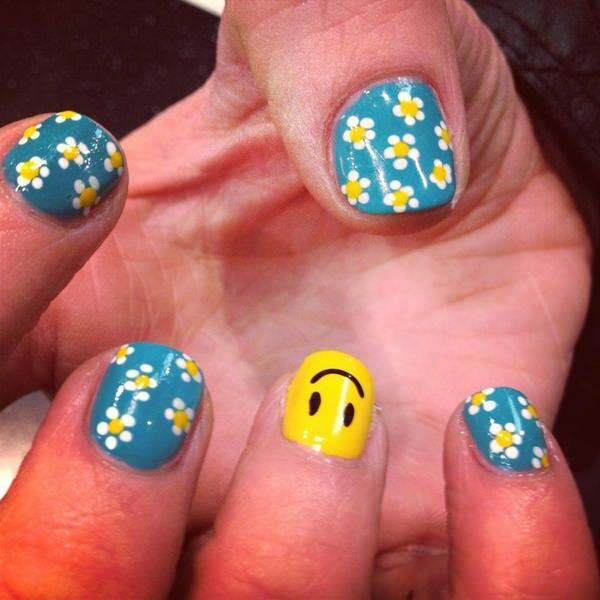 Replace one nail on both hands with a happy face and you’re sure to be smiling for days to come. For custom nails like this, they should be done by hand but I must warn you, it’ll take a steady hand a good amount of time depending on how good you paint! The patterns originally come from Native American designs, but have become popularized in fashion for those of us living in mountainous areas. 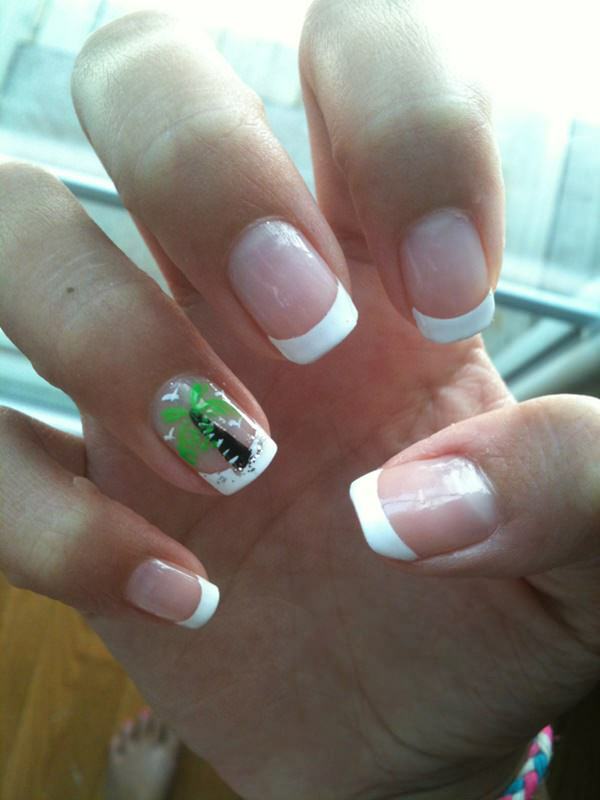 Adding a reign deer will have others gushing over how much they love your nails. For a more posh design, you can keep an arrow’s edge unpainted on each finger and add gems to one, two, or however many finger’s look good to you. A design like this can be great with either gold or silver, depending on what your outfit or style calls for. Some of us love color, and that’s what you get the most of here! A theme like this is easy to create. 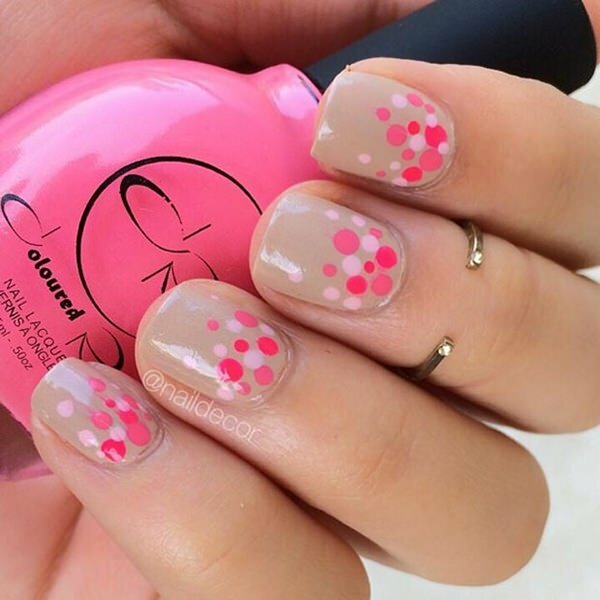 Simply paint your nails white (double coat may be needed), ensure you drip tiny* dots of polish on your nails, and wait for them to dry. If you don’t wait for them to dry before putting your clear top coat over them, they’re sure to smear! Are you an artist? Do you like hipster-esque fashion? 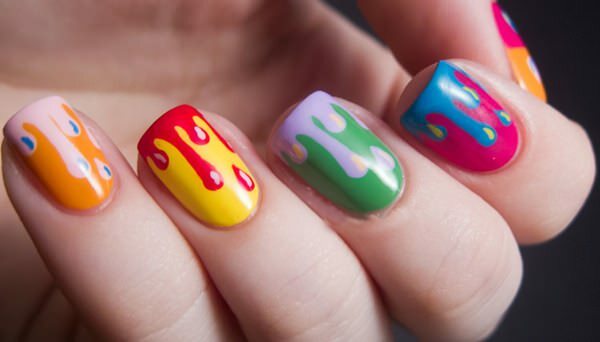 Dripping paint is an awesome effect on nails, as if you’ve dunked your fingers in differing pails of paint. Who doesn’t love a great vampire series? 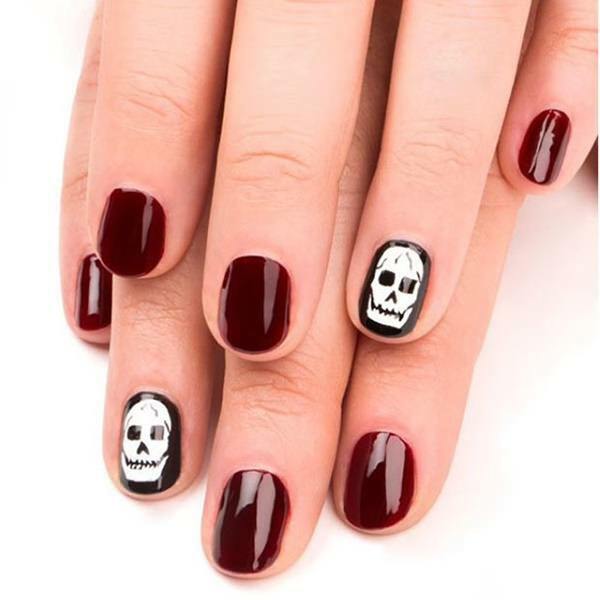 It doesn’t have to be Halloween to sport around bloody and bleeding nails. 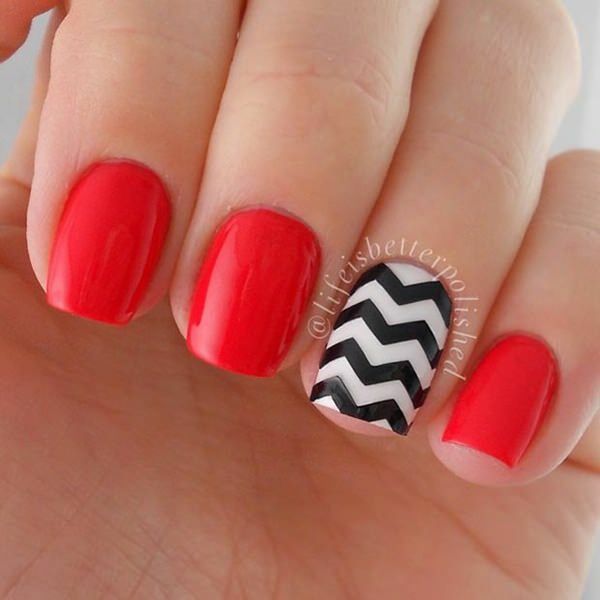 If you’re a True Blood fan, you can decorate each nail differently using reds, blacks, and white. 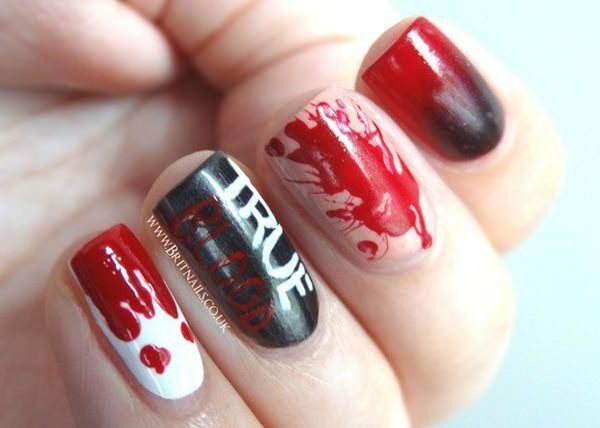 To show off your dedication, “True Blood” can easily fit on one nail if you use a toothpick to write it. Most of us have seen the almost irritatingly bright red-orange nails that many women have tried out. If you’re a fan of the color or the sheer attention they grab, you can still make the design your own by switching it up with one nail on each hand. Why not some black and white zig-zags? Bows are becoming popular, especially if you’ve a job that doesn’t exactly call for too much handy work. 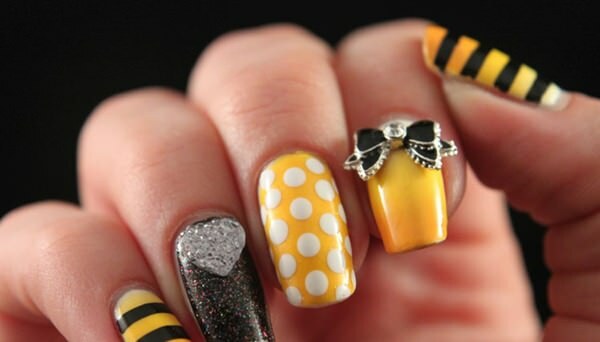 If you’re comfortable wearing nail jewelry such as the bow seen here, you can grab a black one and create a black and yellow theme that’s unique, cute, and totally summer. If you’ve any kids or even nieces and nephews, you can amuse them simply with your finger tips! 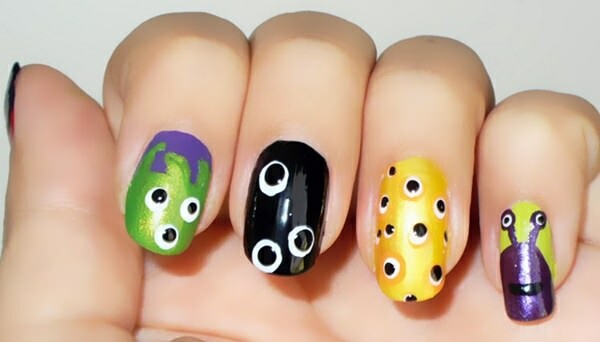 Paint little aliens or monsters on each one of your nails to get the giggles out of the little ones. Fashion trends. They’re everywhere, and they are constantly evolving. This generation has somehow decided that mustaches are in and fabulous, and placing them anywhere is accepted and a must-do. 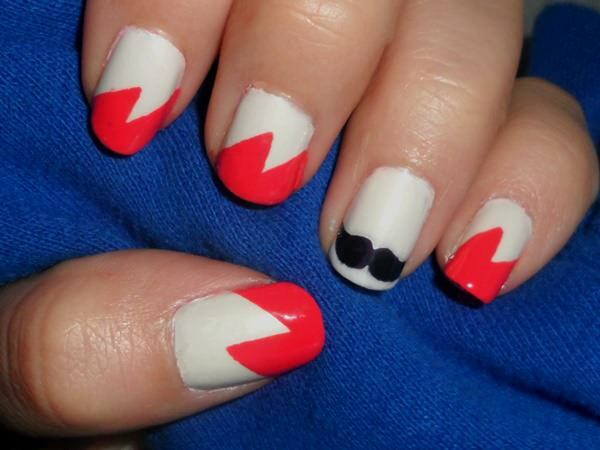 You can find little mustaches for nails in a beauty shop or even paint them on yourself, they’re easy enough! An easy design to create for many of us, the only thing you’ll really need is patience. Place small red dots side by side, with enough room for their stems above them. To make the stems, simply connect the dots with a triangle and an added side line for the stem’s edge. Don’t forget to wait for the red dots to dry before adding the smaller white dot atop them, to add a shimmery effect! You can’t go wrong with natural pinks. 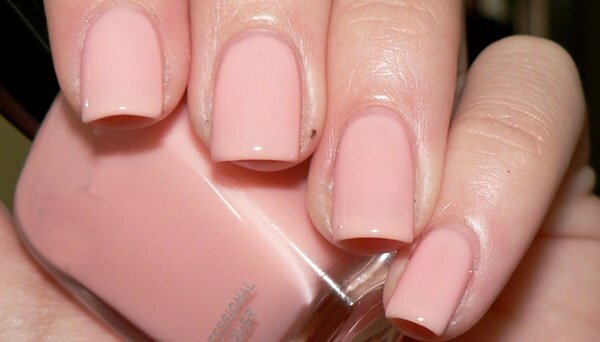 To add some contrast and definition, you can place lighter and darker shades of pink towards the bottom of each nail. Perfect for spring, a peach color can work well on those of us with lighter skin. Gold glitter is a lovely added touch in the center of each flower. 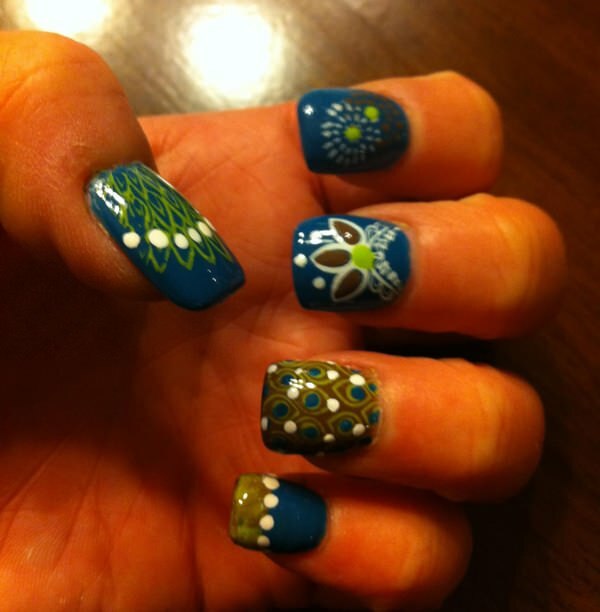 Ensure each flower is in a different position on each nail for a look similar to this one. 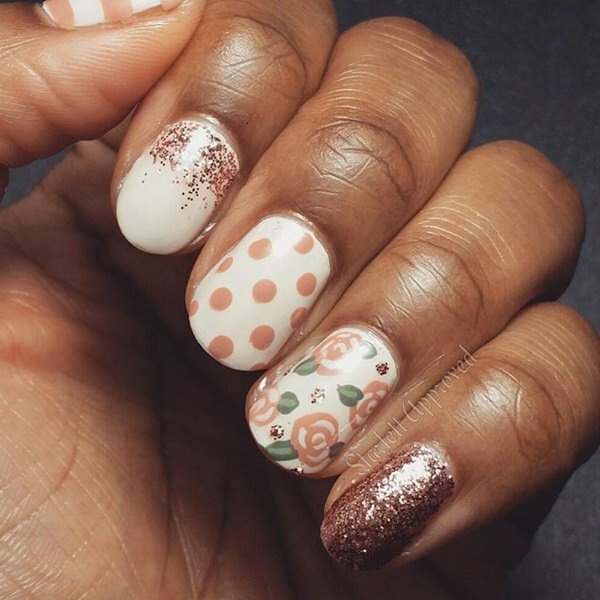 Dazzle at a wedding, turn heads in the club, or sport them at a formal event – these nails will turn heads and have people asking you where you got them done. The many gems will reflect as much light as a diamond ring. Just make sure your design doesn’t get caught on someone’s sweater! You can find the tiny colored beads/bubbles in either the beauty section or hobby section of a store. 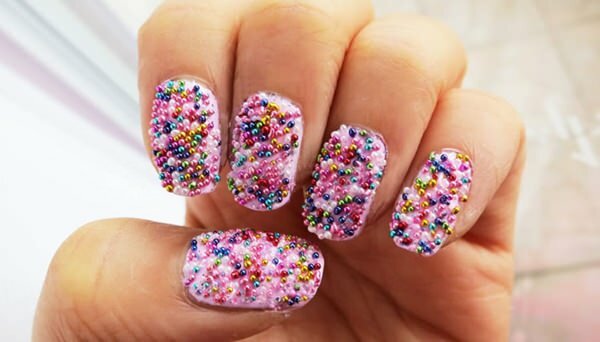 Paint your nails the desired color you want, let dry, Add either a second coat of nail polish or clear layer of glue, dipping your fingers into the beads immediately. 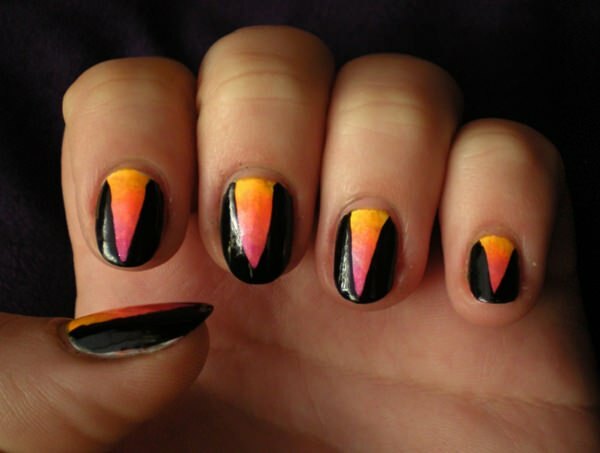 Ensure you place a top coat of either glue or nail polish so they don’t fall off. This gorgeous design looks great if you’re wearing silvers and attending a formal event. They can also substitute the “True Blood” design seen further above in this article as a fabulous means of expressing your love for vampires. 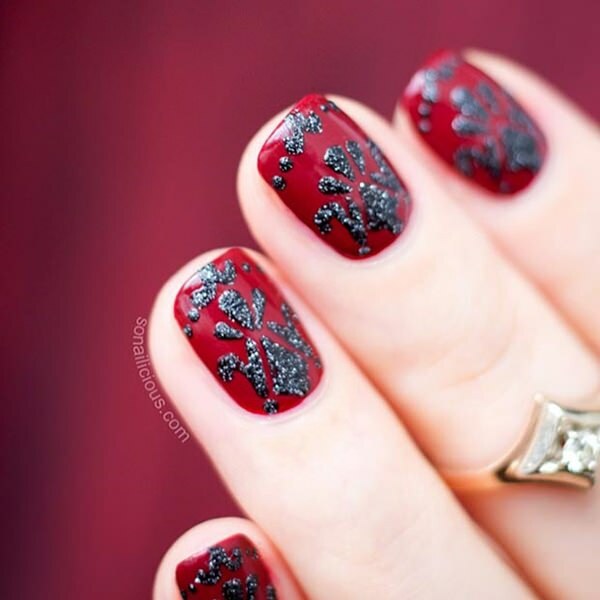 Blood red mixed with a glittering black Victorian design is subtle yet makes a fashion statement of your love for the classics. Blood red nails with a single black one on each hand, sporting a skull. For skulls like these you’ll have to find the proper nail stick. 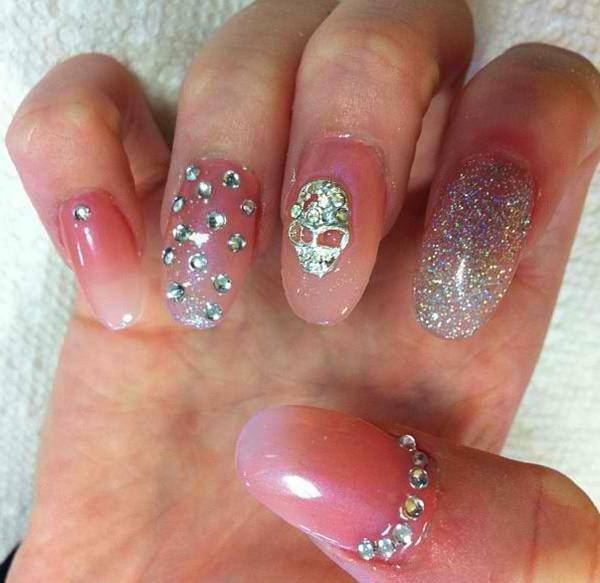 If you’re feeling adventurous, try creating a skull on a piece of paper with polish before trying on your nail! Sometimes it’s too hard to choose which shade looks best… So why not sport them all? 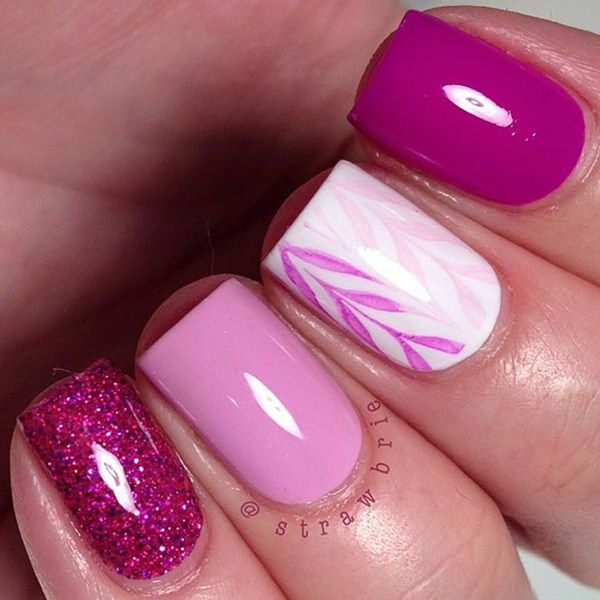 Create your own pink theme by putting a different shade and texture on each finger. Add glitter to one, leaves to another, and keep a few plain. 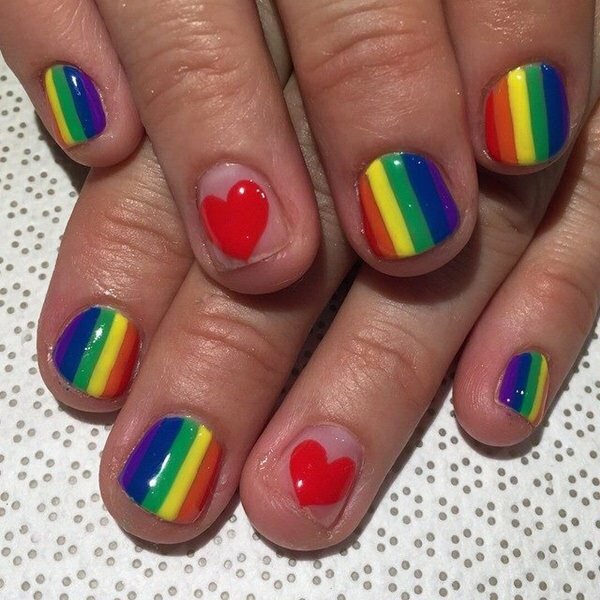 Some of us prefer not to get too crazy with our nail designs, and would rather show off the shape of our healthy nails instead. Shape your nails to your liking and slab on some natural color! Here we can see a great twist with natural tones. Subtle glitter adds a lovely effect, and placing shimmering glitter all over one nail on each hand will have your style popping out. 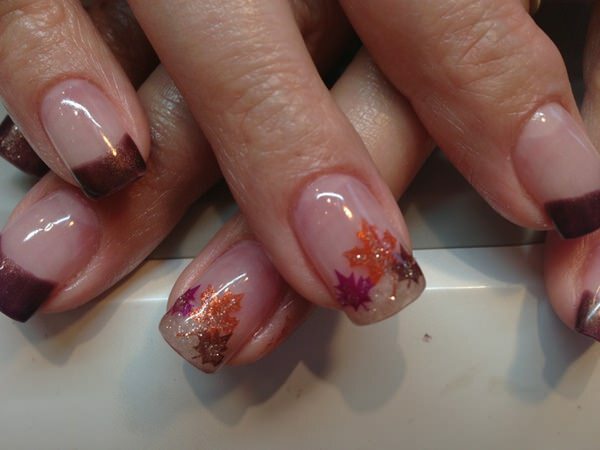 This design resembles either a gorgeous starburst on each finger tip or the autumn colors of fallen leaves. Perfect for autumn, this design can be done in either gold or silver. 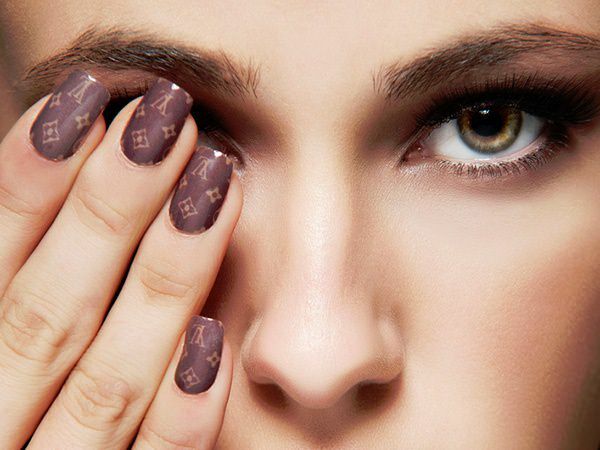 French manicures are chic, elegant, and timeless. They can be worn with any outfit and still look fabulous. However, if you want a subtle touch of personalization, or you want to show off that you’ve been on vacation recently, add a little palm tree with seagulls. The edge of the French manicure makes it look like a little island! Here it is – the bright red-orange that has recently been popularized along with the mustache that has been equally popularized. 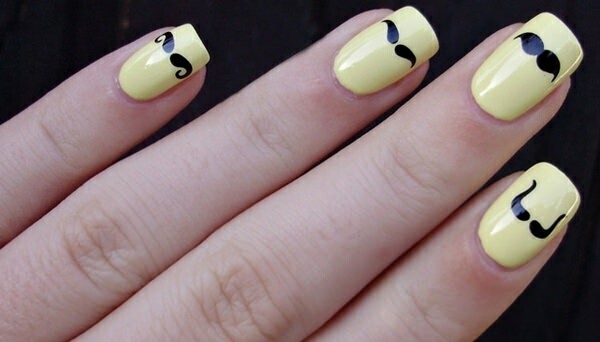 If you create a design like this on your nails, you’re a true hipster. 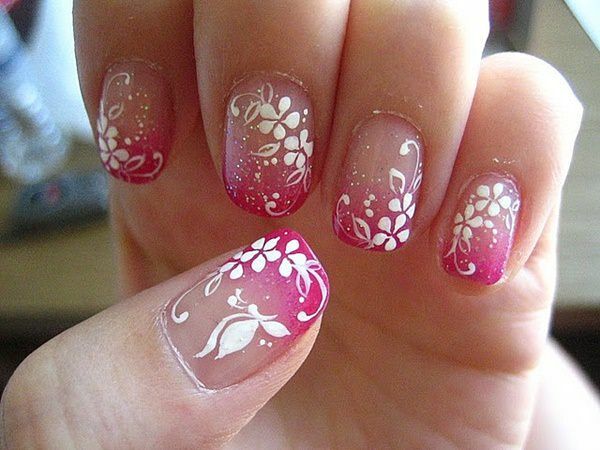 Done completely by hand without stickers or fake nails, this design is easy enough if you’ve got a thin polish brush or even a toothpick. Paint one paint black, two nails white, and two nails pink. Use contrasting colors for the designs. 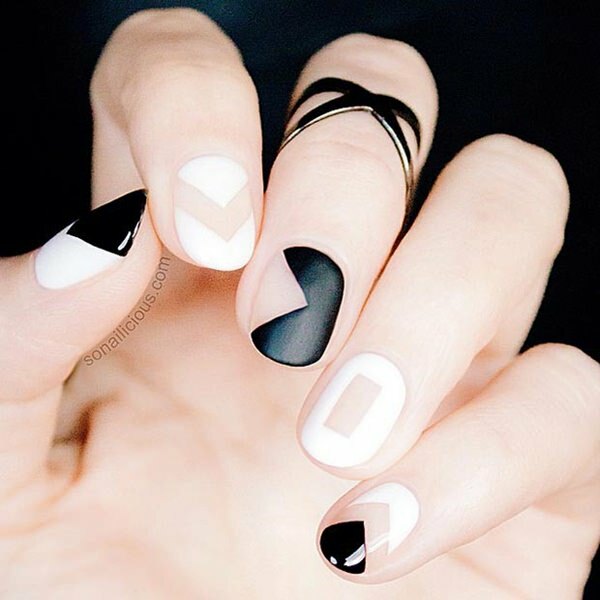 Slightly abstract, here we can see that it doesn’t take much to create this design – yet it adds depth and the contrasting white nail in the center adds some flavor! Fashion lovers, try this Chanel design out. 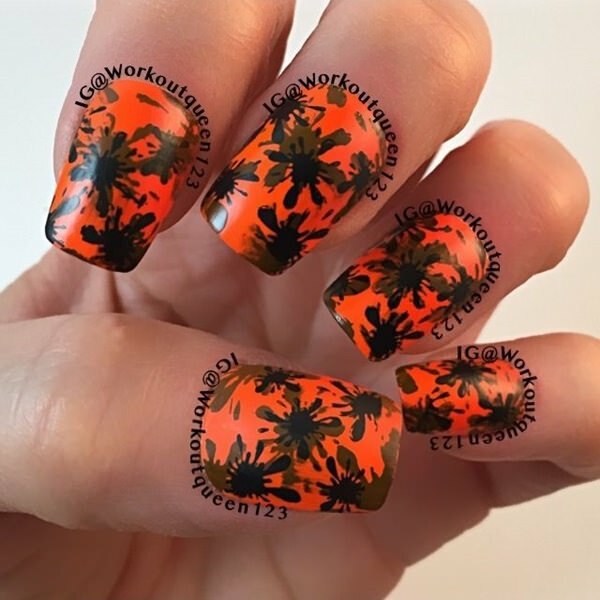 The brand sells their own nail stickers and you can choose to sport their logo on either one, two, three, four, or all fingers! Chanel is known for its lovely feminine wear, so a plush pink makes a great background color. 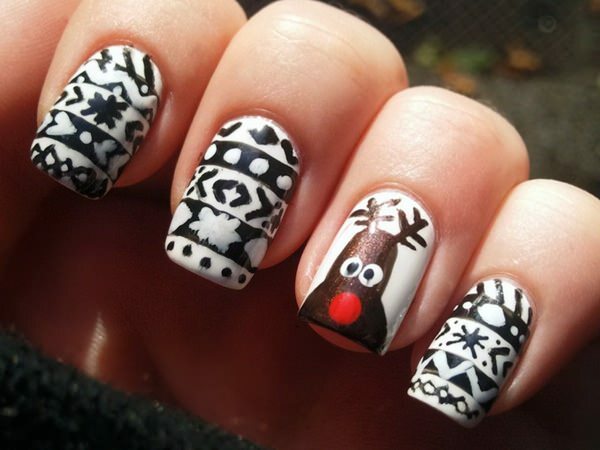 Get creative and think of some interesting designs that remind you of Chrismas! The holiday season is underway and everyone is getting prepared. 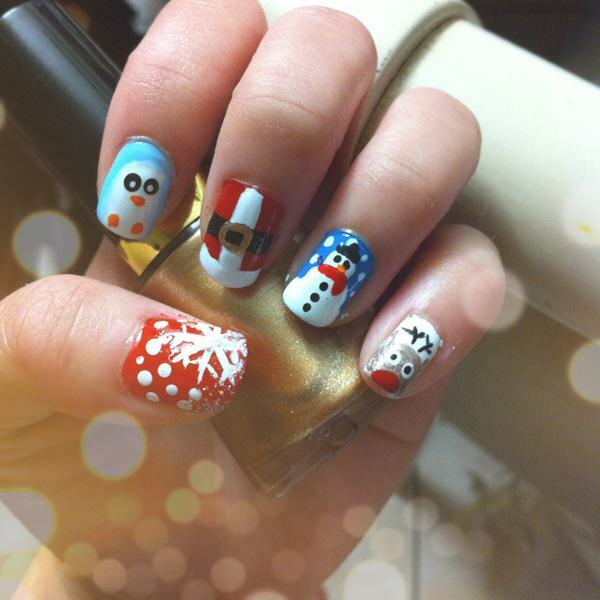 Show off your creativity with a penguin, snowman, reign deer, Santa’s coat, and a large snowflake. A shade of polish like this looks elegant on those of us with darker skin, and adding silver décor to one finger on each hand has your manicure stand out. If you’ve got an undying love for your country, you can show it by creating mini pieces of art representing your love on each nail. 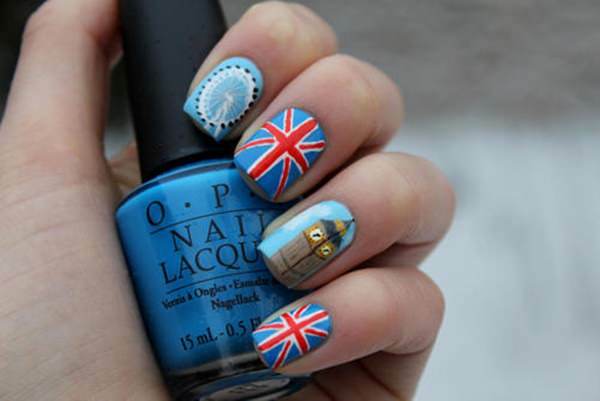 Two British flags, a Bell Tower, and Ferris wheel properly display the wonders of Britain. Some of us are definitely more geeky than others, and many aren’t afraid of anyone knowing it! The design seen here would be fabulous if wore during finals in Chemistry or Biology. 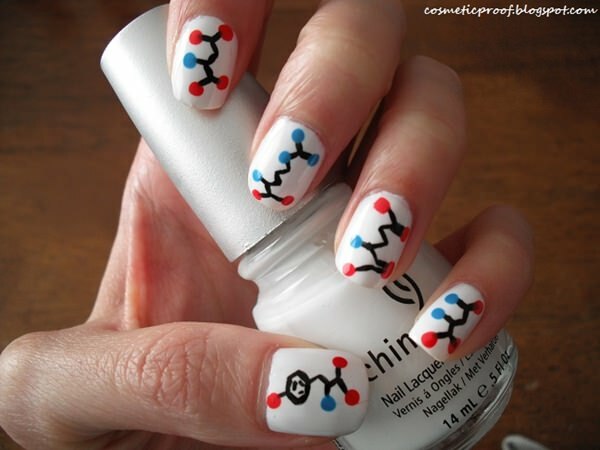 What’s best is you can make a different molecule on each nail! 39. Pac Man Pretty! 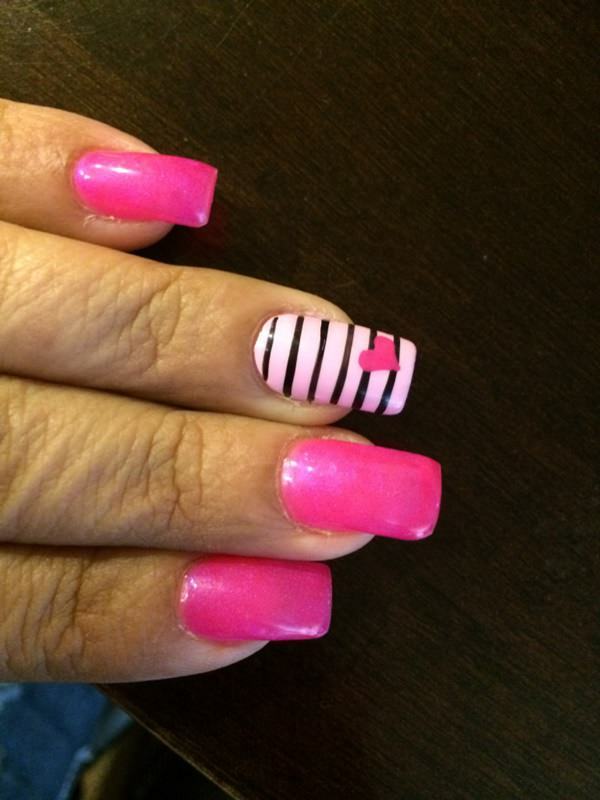 Watch out, a nail design like this can only mean one thing. A hard-core gamer is on the loose! 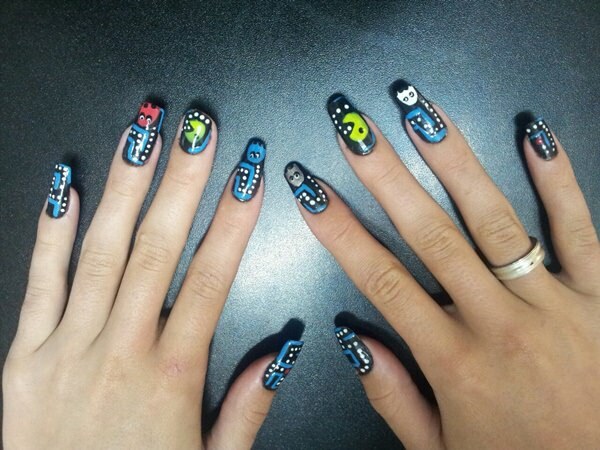 Show off your love of classic video games with this easy-to-create Pacman design. Make sure your nails are extra long so you can add the needed details seen here. 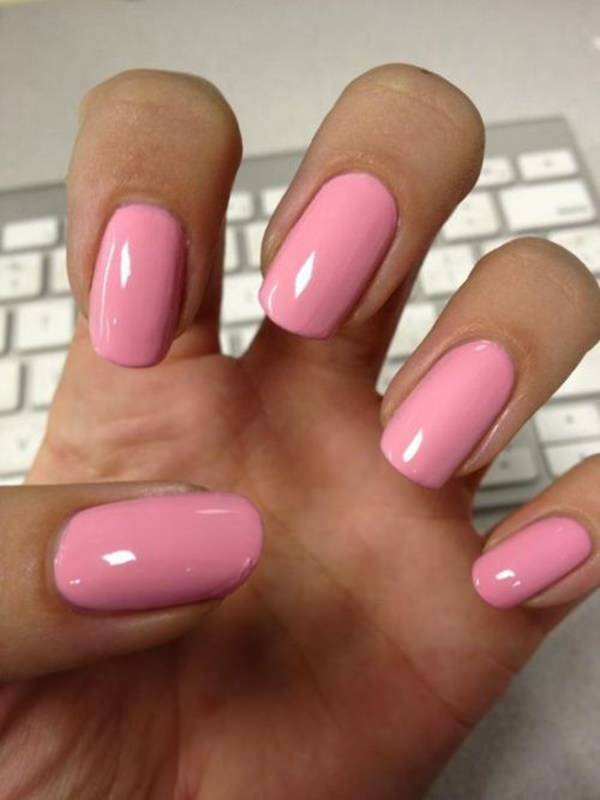 Simple and posh, a pink like this is bound to go with most of your outfits and looks great with casual wear. 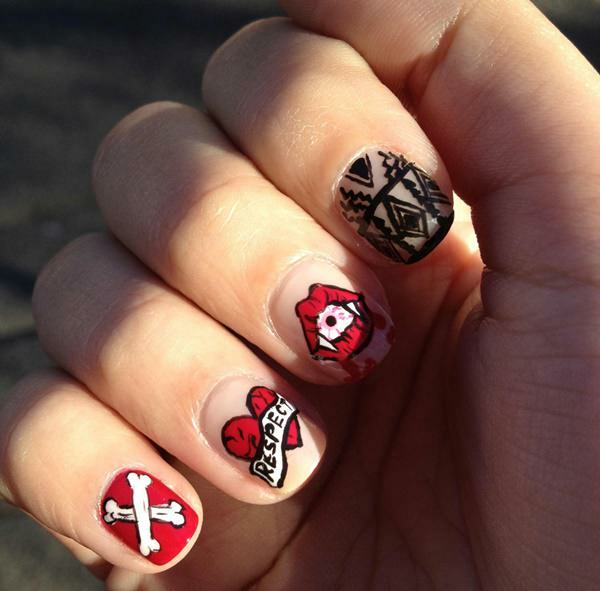 Gorgeous design for girly punk rockers out there. Each nail is its own design, having on-lookers glancing twice. 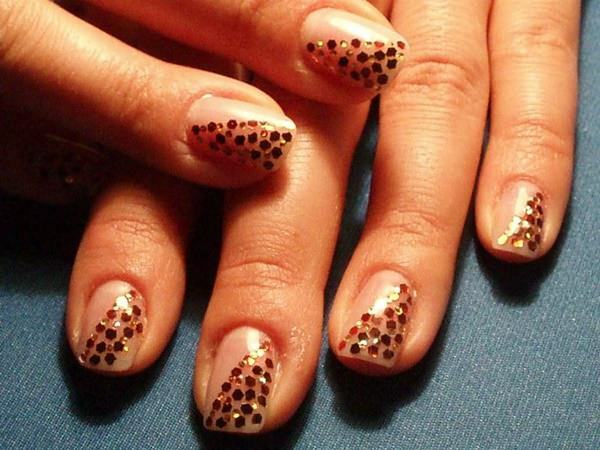 A single nail with a leopard design on each hand adds just enough detail to have your nails stand out. Another design specifically for fashion fans. Louis Vuitton stickers can be found where else – a store sporting Louis Vuitton! Anyone can create a unique design on a single finger after painting their nails their favorite color. Go with your instincts! Here we see a personalized design, one you won’t anywhere else! Get creative and play with gems and stickers. The lunula, which is the white crescent at the bottom of your nail, can be played with and created like in the pic seen here! 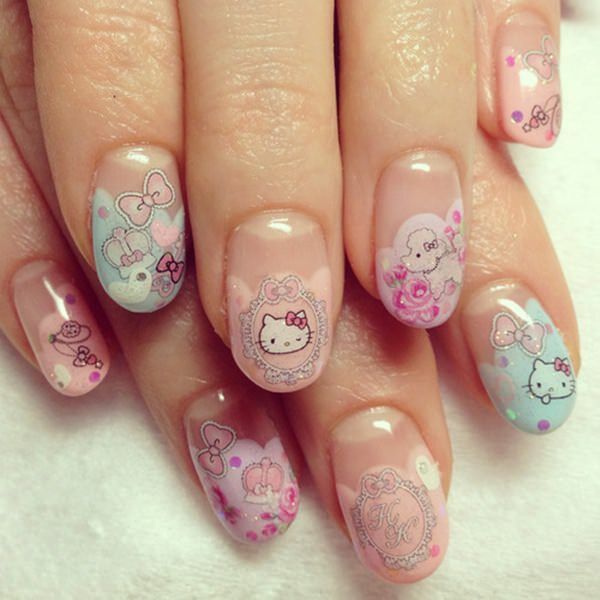 Find your inner cutie and try out some Hello Kitty nails just once in your life! You’ll feel like a little girl again, and sometimes, that’s the type of therapy we need once in a while! 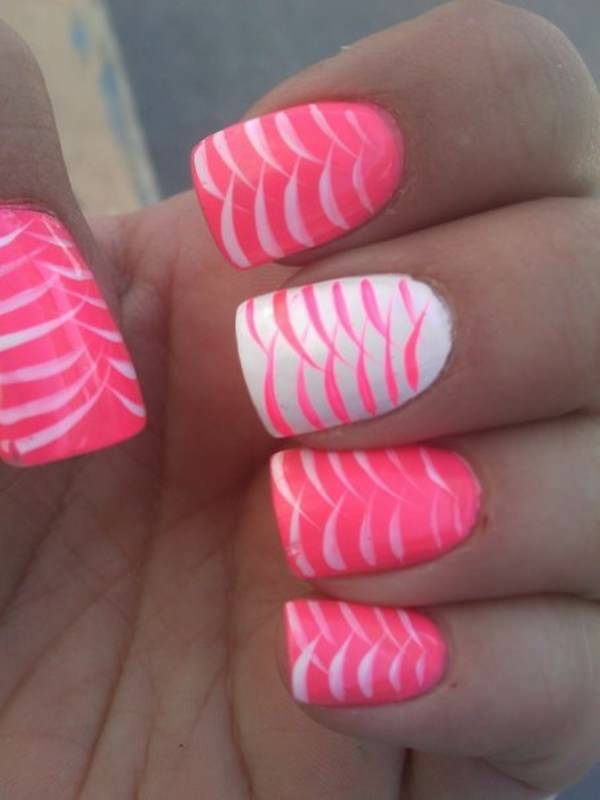 These nails look like they’ve been dipped in frost, and to make them stand out, one has vivid swirls. 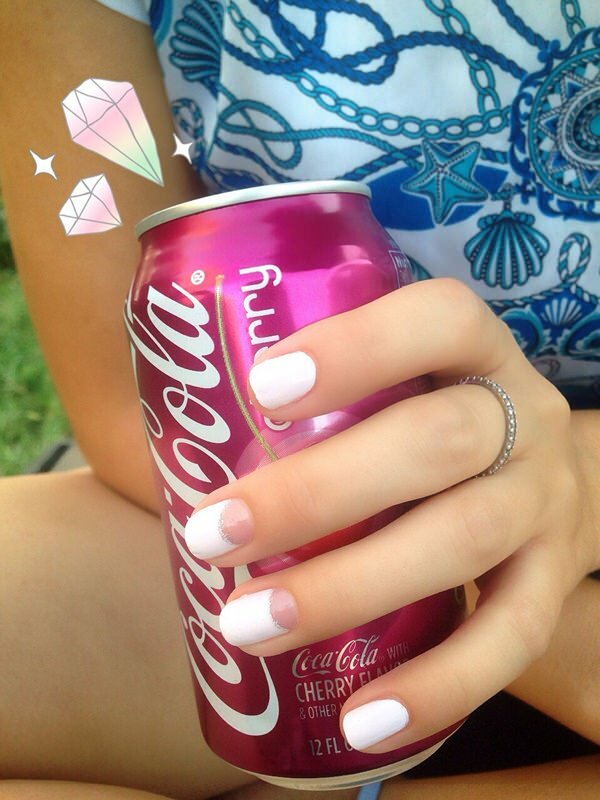 We dare you to try long nails! They’ll make you feel pampered and fabulous. 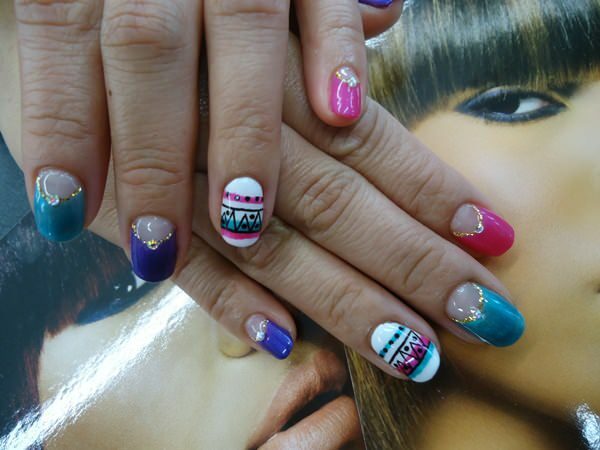 Speaking of pampered, these nails take a bit of time to create but are worth it, especially if you’re planning to attend a concert! This design is great for Valentine’s Day, whether you’ve got a date or not. Paint each nail a different color. 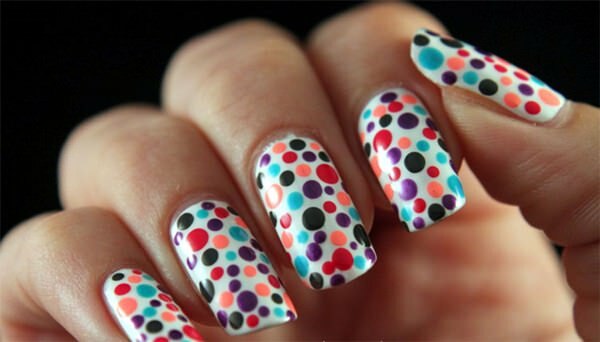 Place small splotches of a couple different colors on each nail after they’ve dried. Swirl them together. Let dry. Place white outlines in the form of butterflies over the splotches – et Voila! Add hearts! 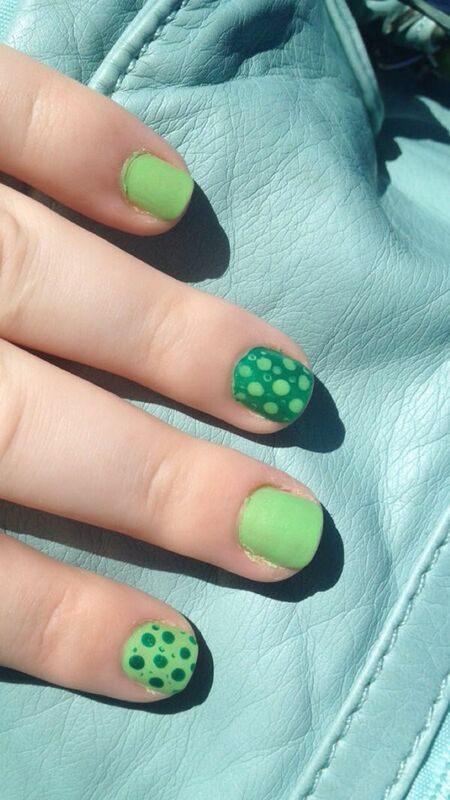 Not many girls go for green on their nails, but with a design like this, why not? Chocolate lovers abound! 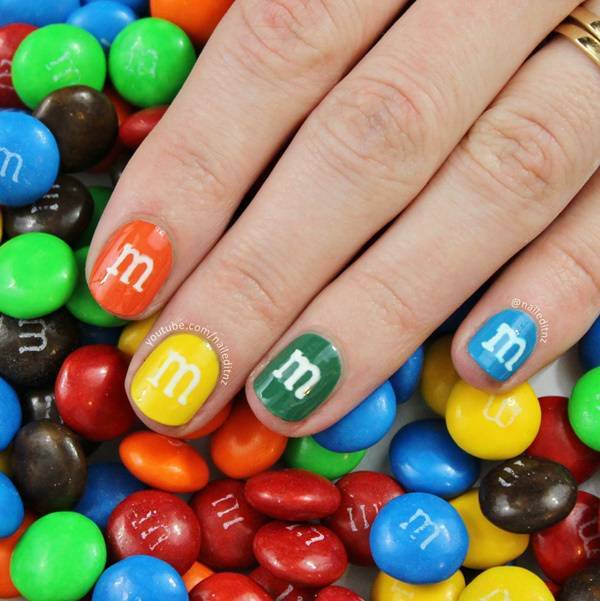 Painting each nail a different color and sporting an M on them screams your love of chocolate candy. 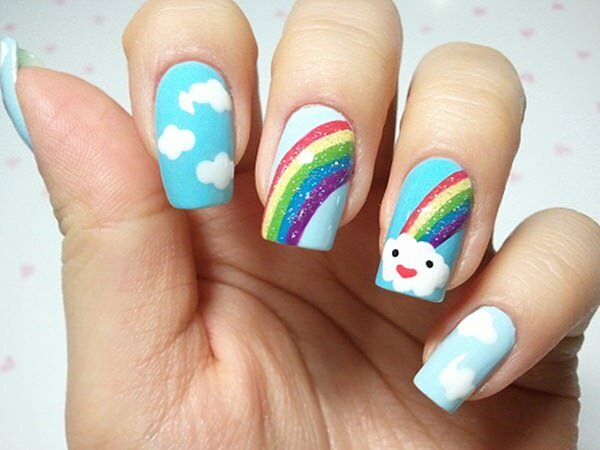 You don’t need kids to have fabulous nails like this. Love rainbows? Maybe you support equal rights? 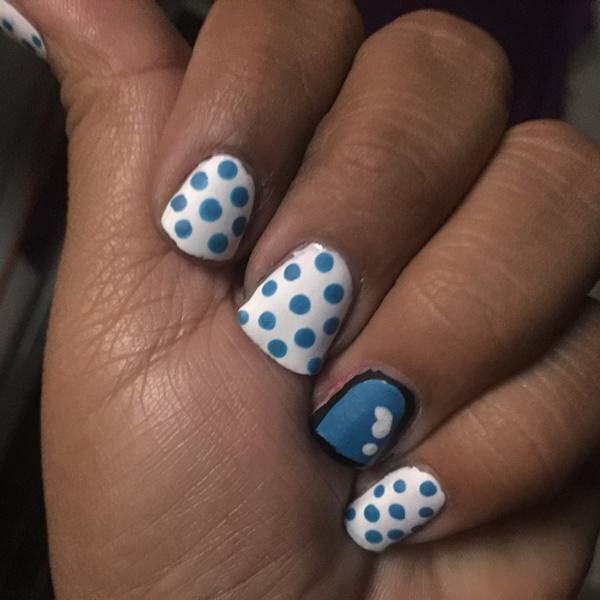 If you’re head is always in the clouds, show it, and make it look like you’ve grabbed pieces of the sky with silver rain-drop gems and clouds. 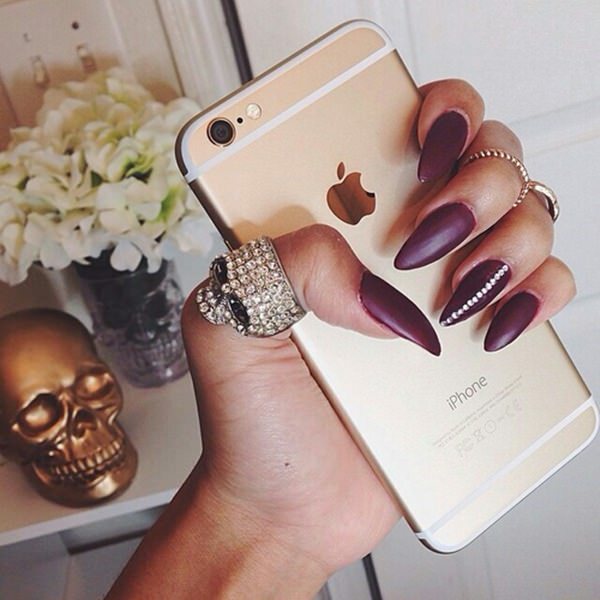 Deep plum stiletto nails with rhinestones. You’ll look glamorous and quite rich, for that matter! Wow people on Halloween with a cool design like this. 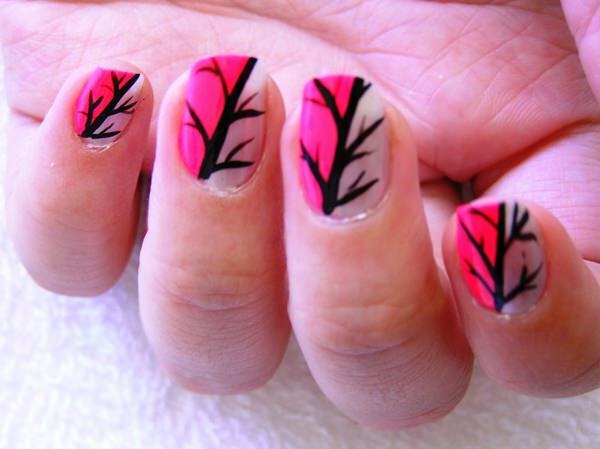 Create the spiders and webs with a thin nail polish brush or toothpick. Powder blue looks wonderful in the spring or summer time, and works will with jeans. 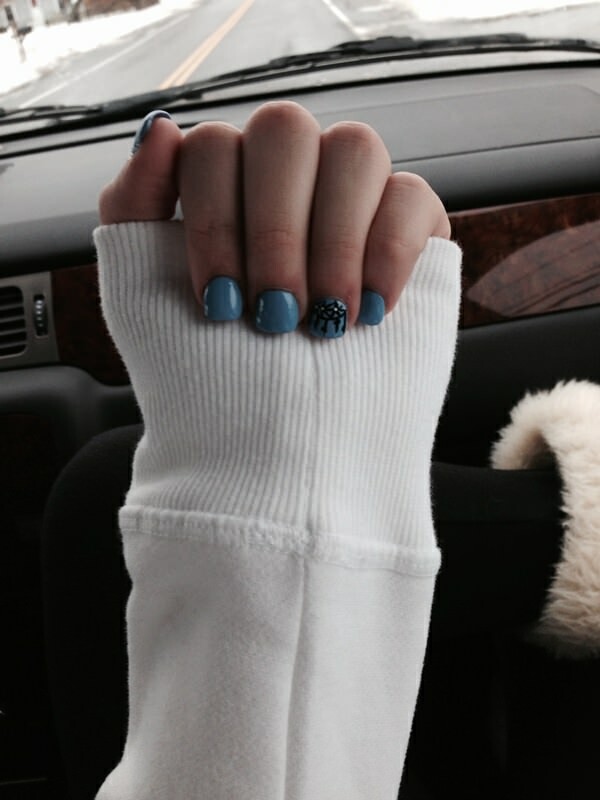 Sky blue dots and white create a fun and creative look as seen here. Clever! 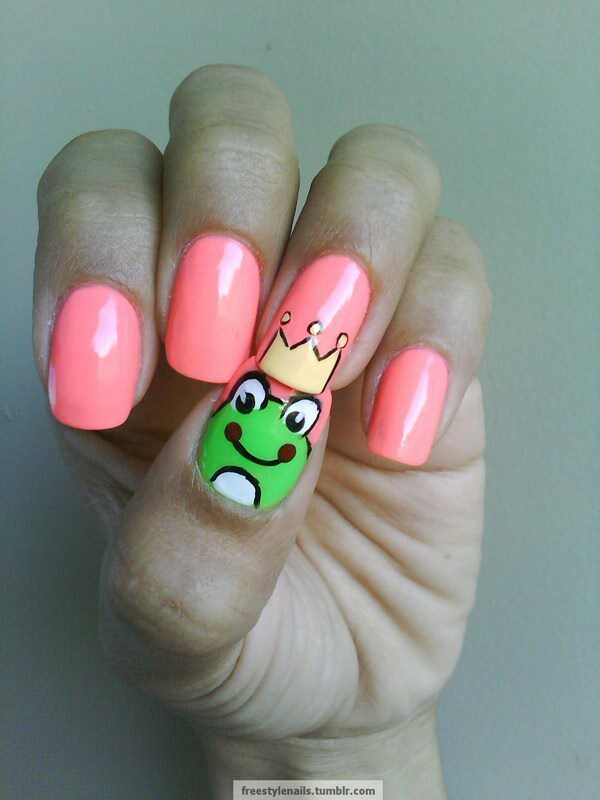 You can get creative with a design like this, sporting any animal of your choosing or keeping the frog prince! 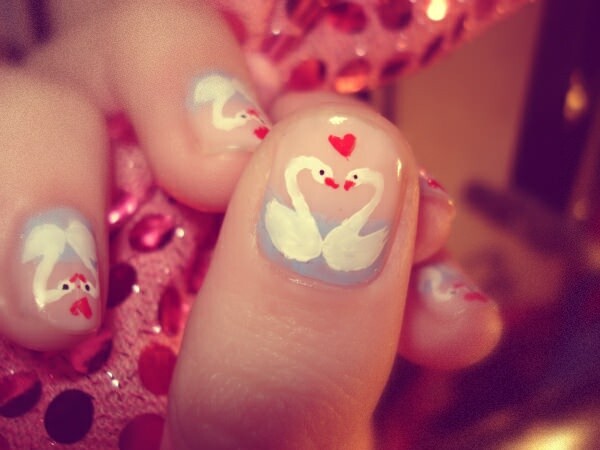 Another lovely design for Valentine’s Day, two swans forming a heart with their necks. Luckily, these birds are easy to create in polish. 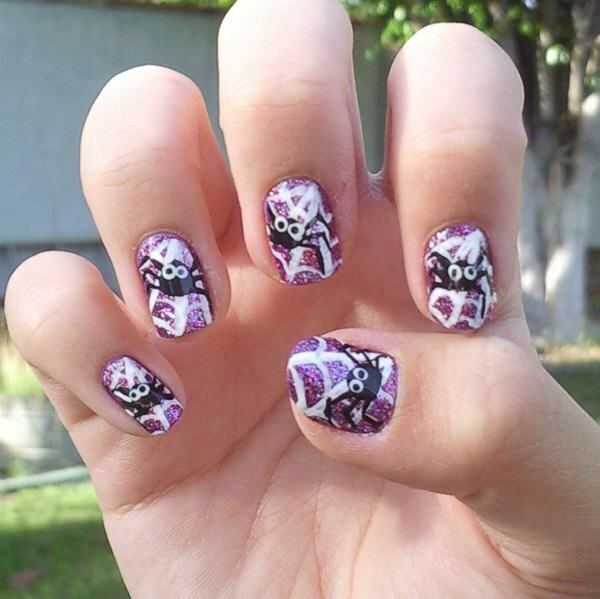 This is a much more intricate design with spiders as the theme. 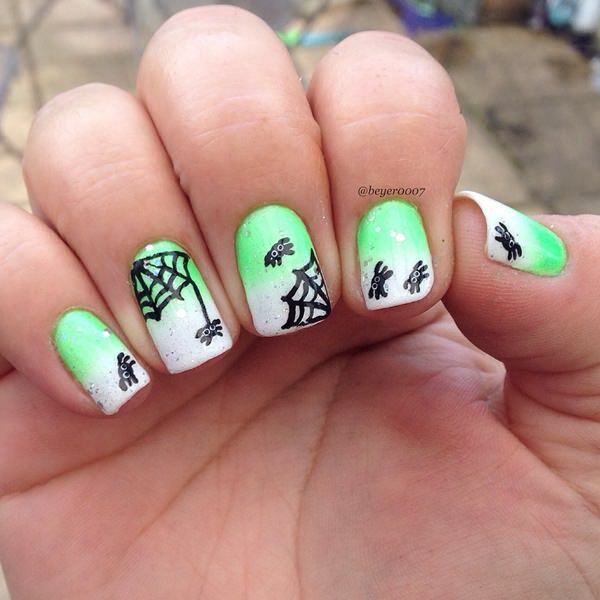 You’ll need to find the right tools to use for this design depending on your nail size and the size you want for the spiders. 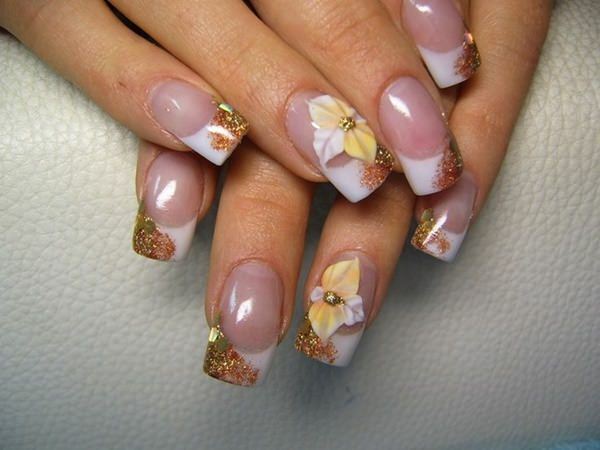 Gold glitter looks glorious with beige flowers and/or polka-dots. Where are my 80’s lovers? Remember the abstract geometric designs that were so popular? Bring them back, and add some glitter to your statement. Another favorite, book lovers will enjoy a design like this. Look good while flipping those pages. 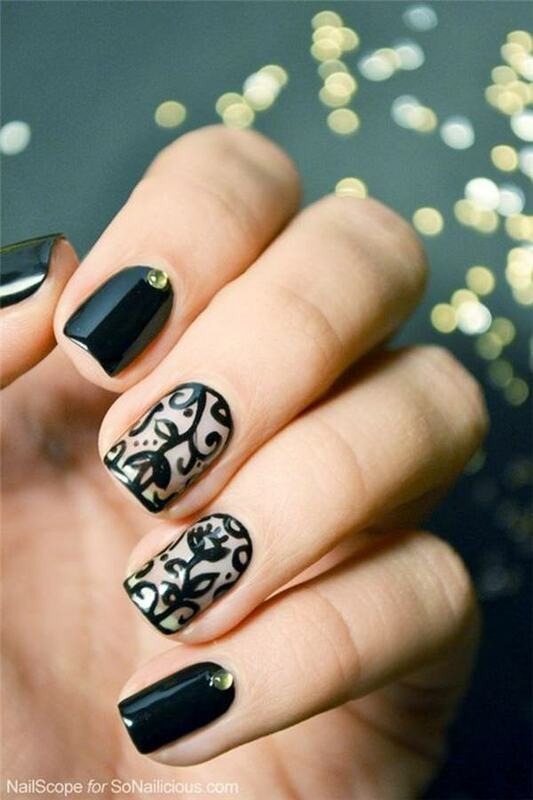 Create your own patterns and personalize your nails instead of grabbing something off the shelf at the store! Truly unique, this design is fiery and dark – great for Halloween no matter what your costume. Colorful, classy, and perfect for a winter vacation. 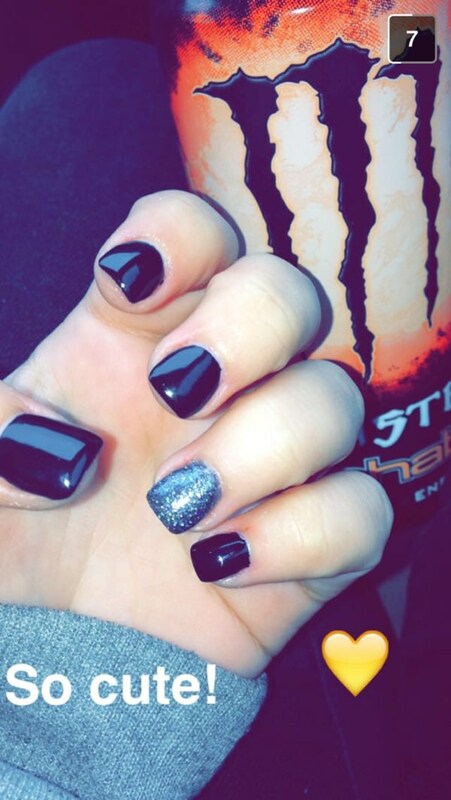 Black nails with a single glittered ring finger. This design’s patterns and golden beads remind us of a fancy hotel or classic movies. 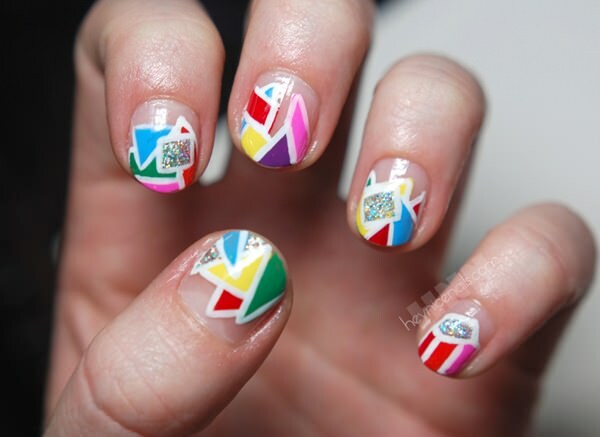 Geometric shapes look brilliant on nails when mandala patterns are used. These take time and a steady hand to complete. 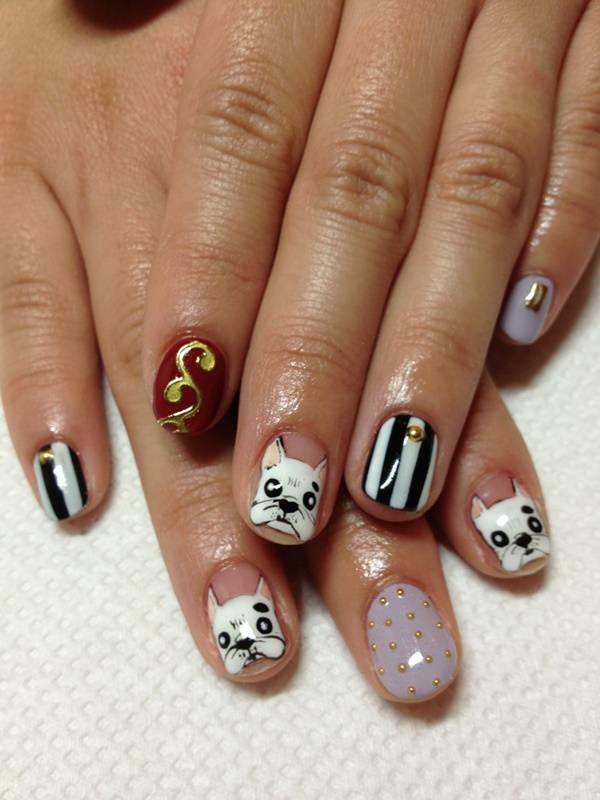 These designs were done atop a French manicure. 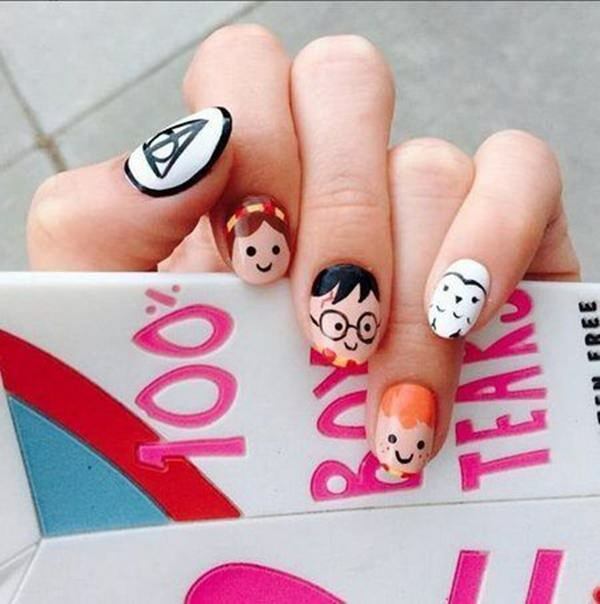 Sport your favorite movie on your fingers with the faces of characters you love. Here we have Hermione, Harry, Ron, and Harry’s owl! Enjoy hunting or paint balling? This design resembles both and the colors can be switched to suit your style. This design is perfect for anyone that has a love for rainbows or is supporting equal rights. Mosaic glitter is used to create this dazzling design . It looks great with a background color or no color at all as seen here. 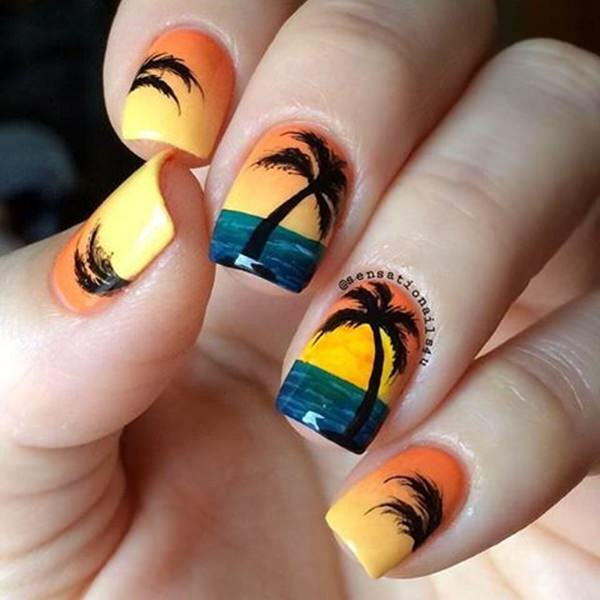 Unlike the one above this one, this design is done in brilliant colors and black silhouettes of palm trees to truly bring out the serenity of the ocean. 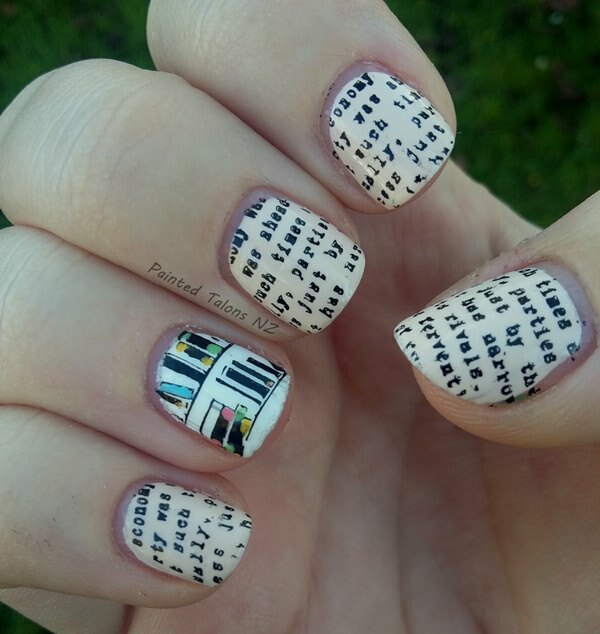 True art on nails. 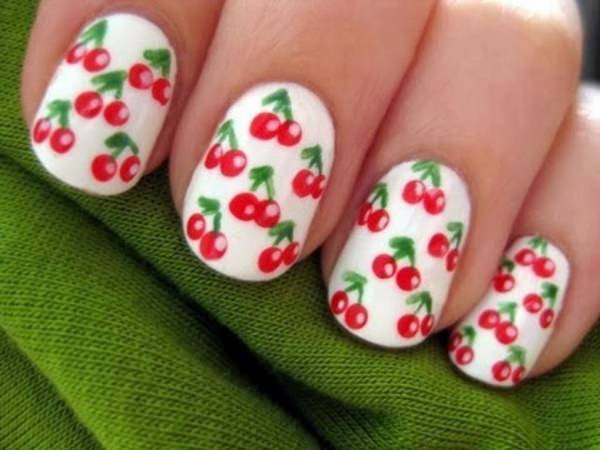 If you want cherry-tipped fingers, create this design with rounded tips. 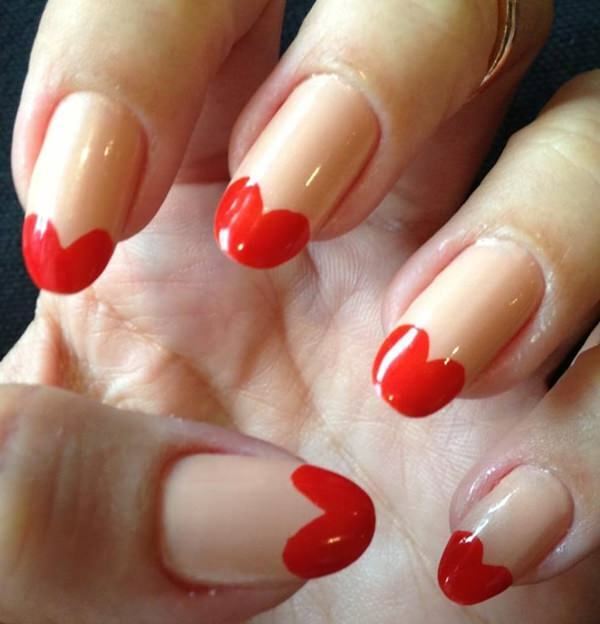 If you prefer more of a heart shape, go for stiletto-shaped nails. Here we see a beautiful design perfect for summer or autumn weddings. 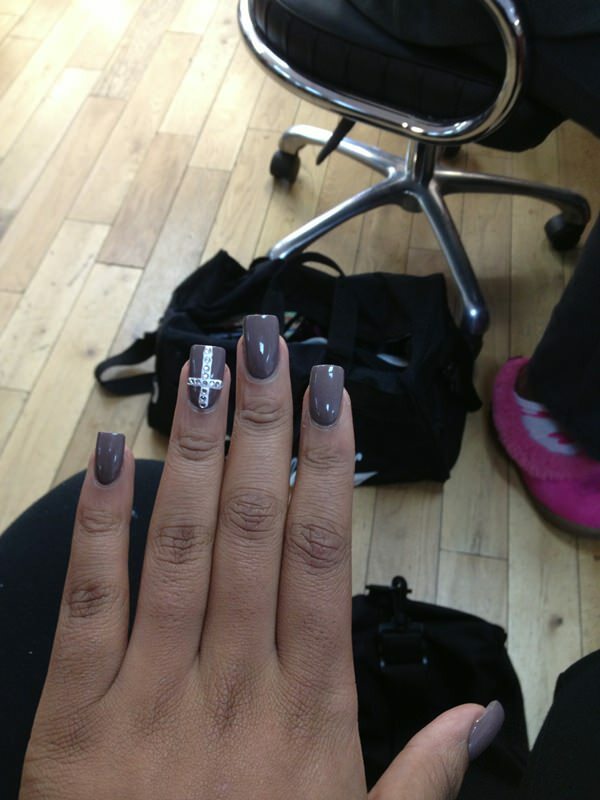 The middle finger has a matte polish, an interesting detail for a modern twist like this. 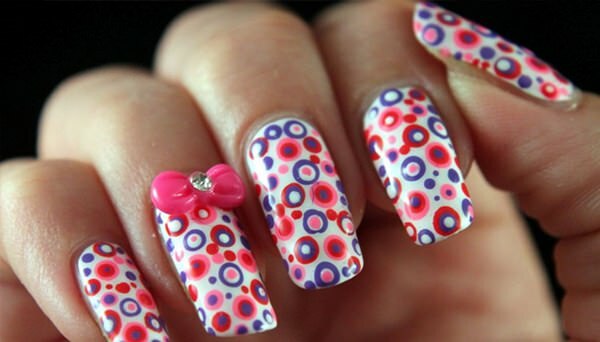 This are truly unique polka dots, sporting dots within dots and the cute touch of a bow. The colors can be any you choose, but make sure they contrast well. Autumn is gorgeous month, filled with oranges, reds, golds, and purples. 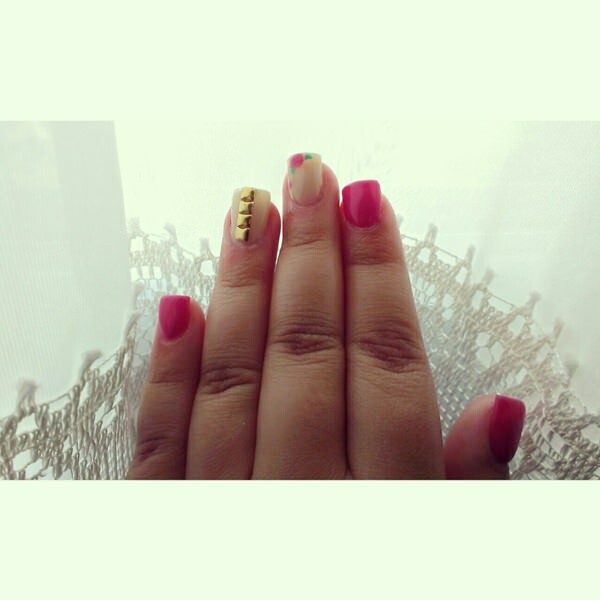 Dazzle these colors up with glitter and sport them on the tips of your fingers. Next article26 Smiley Piercing Pics for Deviant Looks + Care Tips!